‘Wait a minute boys, I want to play too’. 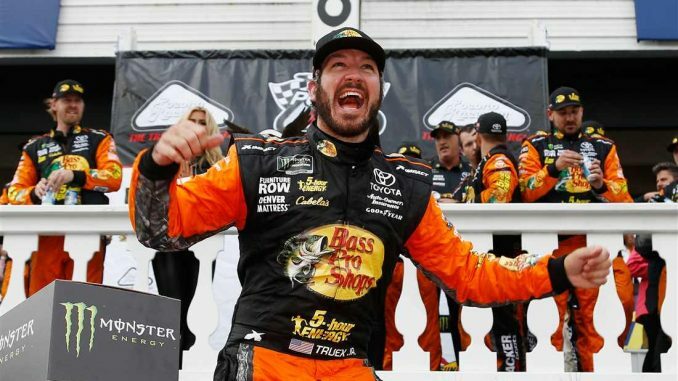 That’s the message Martin Truex Jr. sent Sunday as he beat arguably the two hottest drivers on the circuit right now in route to victory in the Monster Energy Cup Series Pocono 400. With a roll of the dice, Truex stayed out while several of the leaders pitted with 20 laps to go during a caution for debris. Among those who stayed out with Truex was Kevin Harvick who has been the driver to beat and continued that story Sunday having led a race high 89 laps up to that point. Among those who did stop was Kyle Busch who won at Pocono last July and was looking to repeat. Busch restarted eighth and was soon charging to the front on his fresher tires. Busch was up to fourth when Denny Hamlin crashed and set up a 10 lap shootout. The restart was aborted when Erik Jones crashed on the restart and the final restart came with 7 laps to go. Kyle Larson took a shot for the lead entering turn 1 but Truex would have none of it and blocked him. 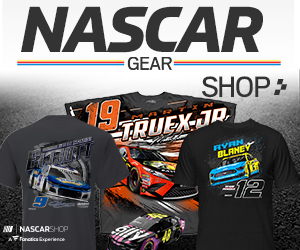 Truex held the lead and in clean air began to stretch his lead out. Kyle Busch shot past Harvick and dueled with Larson over the course of the final laps, but to no avail as Truex sailed to victory by 2.4 seconds. “Just really a crazy situation there with how all that kind of transpired and went down,” Busch said. “But we fought hard for the finish and tried to get the most out of what we could there and just couldn’t pass. With his 17th career win Truex becomes the third multiple race winner in 2018 having won the fifth race of the season at Auto Club Speedway. Harvick, who has five wins this season, held on for fourth, Brad Keselowski was fifth. For much of the 160 laps it was all Harvick. Only Truex who led 31 laps and won the first stage, and Busch who led 13 laps seemed to have anything for him. The win for Truex did not come without adversity. During pit stops after stage 2, won by Harvick, the ire changer had trouble with the left rear tire and Truex came back out to restart 14th. He went from 13th to 6th in the second stage, and in the end onto victory. Polesitter and defending race winner Ryan Blaney came home sixth, Aric Almirola seventh, Jimmie Johnson who led his first laps of the year during green flag stops finished 8th with Joey Logano who made up a lap after a pit road speeding penalty finished ninth and Chase Elliott was 10th. The Monster Energy NASCAR Cup Series heads to Michigan International Speedway for next Sunday’s Firekeepers 400. The green flag will come just after 2:00 p.m. with live coverage on Fox.